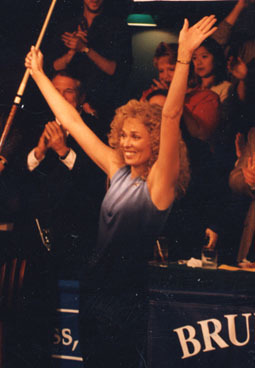 1998 WPBA Brunswick Cues Boston Classic . April 26, 1998 . Boston, Mass. Ewa Laurance was one shot away from her first WPBA Classic Tour win in three years. Her husband was doing play-by-play for ESPN, her sponsors for the last decade were in the stands, and she was in the poolroom owned by two longtime friends. It was the perfect story. Somebody just forgot to pass the script to the 9 ball. One ball from winning 1998 Brunswick Cues Boston Classic, Laurance jarred a straight-in shot on the game winner. The crowd, already standing to deliver an appropriate ovation, held its collective breath as that misbehaving 9 rolled around the table. Laurance was the star after amending her earlier miscue. Not only did she dog it, but she opened the door for Allison Fisher, who was in her third year as a dominant force on the WPBA and had won the last two tour events. She cleaned up that little mess to join her opponent on the hill. Fisher was set to break for the match, a runout away from extending Laurance's drought indefinitely. "Before she broke the balls," Laurance admitted, "I thought the match was pretty much over." But Fisher provided yet another twist in the plot, breaking dry in the case game. Laurance cautiously moved through the rack. After pocketing a tricky 7, she lined up another straight-in - albeit shorter - shot on that 9. Back of the pocket. No problem. "I've seen a lot of players play really well," she said. "But it's a huge step between actually doing well and winning a tournament." When the 9 fell, Mitch Laurance ditched the headset and hugged his wife on the tournament floor. Laurance, who was the face of women's pool in the 1980s and early-'90s, had a storybook ending for what her last win (to date) on the women's pro circuit. It just needed a second take.